The Incredible Hulk has enjoyed a long-standing popularity through comic books, television shows, and major motion pictures since his debut in 1962. With sustained pop culture relevance comes a laundry list of merchandising opportunities, the most notable of which were discussed in our Guide to Collecting The Hulk. 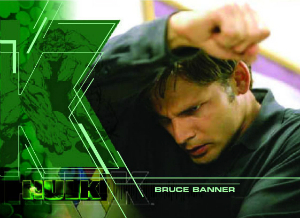 In this guide, we’re going to take a closer look at the Hulk trading card sets devoted to Bruce Banner and his angry alter ego. 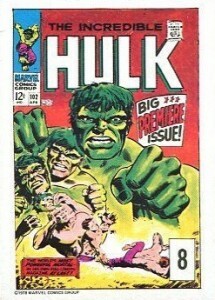 Shop for Professionally Graded Hulk Trading Cards on eBay. The Hulk has been featured in virtually all the trading card sets revolving around the Marvel Universe, so getting every single Hulk card ever made is going to take a great deal of patience and searching. The sets listed below are solely dedicated to the character, whether inspired by the comics, television, or movies that bear his name. There are also a handful of promo sets, listed at the bottom of this article, which may not have significant financial value but do appeal to specific collectors. These sets are all American releases but there are some geographically-specific, promotional sets from Canada, South America, and Europe. Based on the hit television show, 1979 Topps Incredible Hulk is 88 cards worth of production stills that are framed in an angry green border. The reverse of each card is either a puzzle piece or some trivia about the show. Every pack of cards also includes one of 22 different stickers, which is about as close as collectors will get to a chase set from this era. It is very common to find the cards and stickers sold together in online auction listings and prices are never very steep. In fact, the empty retail boxes often sell for more than the cards and stickers combined, but fans of the television show or die-hard Hulk completists will want to snag this set. 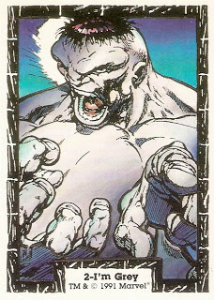 It may surprise you to notice a complete lack of creativity when it came to naming Hulk cards. 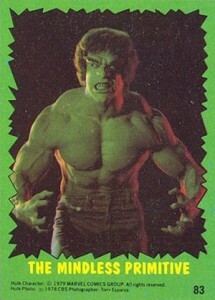 In 1991, Comic Images released their Incredible Hulk set with 88 base cards and zero inserts. If there is one cool thing about this set — and it’s a stretch to say there is — it is that the card styling fits in perfectly with other sets released at the time, namely the Spider-Man McFarlane era cards. Some variation of the white border on these cards is used several times in the early Comic Images designs. While these are of very little monetary value, like many of the cards from that era, they are essential for completists. 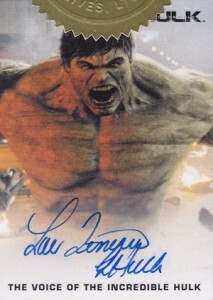 Upper Deck issued their Incredible Hulk set to coincide with the release of the 2003 film. There are 81 base cards that feature images from the movie but the interesting part of this set is the 45-card Famous Hulk Covers and ten-card Illustrated Film Scene inserts. It remains rare to see a company meld the film and comic worlds of a character but these two chase sets make this a well-rounded collection. With 55 inserts to track down, it’s a bit more challenging than most movie-based sets. 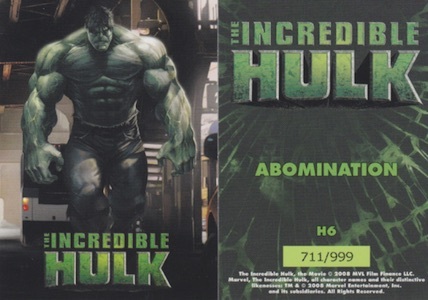 Breaking down the inserts, the Hulk Covers come one to a pack and the Illustrated Film Scene, which are reminiscent of the classic comic cards of the 1990s, are packaged at a 1:6 ratio. There are also two promo cards associated with this collection. At the same time that the Upper Deck cards were on the market, Topps had a 72-card collection of comic-based cards. Each card has a full-bleed, color image with artwork inspired by or taken from the most iconic stories in Hulk’s mythology. Every 12 packs included one of the five Crystal Clear cards which were printed on acetate card stock. This is a very unique set that should be sought-after by any serious collector. Instead of releasing another movie set filled with production stills, Rittenhouse cut right to the chase (see what I did there?) and put together a collection of autographs and relics. 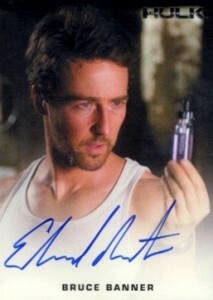 There are two autograph cards — one signed by Edward Norton and the other by Lou Ferrigno — along with six costume relic cards from the film and a numbered movie poster replica card. In total, there were 375 of these sets produced and, as if that weren’t rare enough, there are variant autograph cards. Again signed by Norton and Ferrigno, these incentives feature the formidable Hulk on the front and are limited to only 125 copies each. 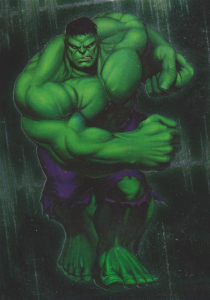 These Incredible Hulk trading cards don’t pop up online in great quantities because there aren’t great quantities to sell, so collectors should keep a watchful eye and snag cards as they become available. Despite the scarcity of the cards, it is possible to build this set for a reasonable price because it contains so few cards. This is about as no-frills as a trading card set can get. 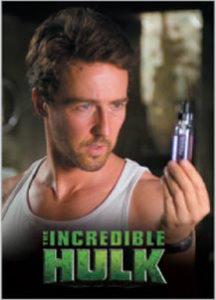 In 2008, Rittenhouse released six cards with pictures from The Incredible Hulk film of that same year. There are no autographs or relics but only 999 sets were produced and, as Rittenhouse releases usually do, they quickly sold out. These cards are incredibly rare and do not come up for auction very often. Collectors may be more lucky at comic conventions or trading card shows but with little frame of reference online, it is impossible to determine what a fair price would be. Having said that, anything more than $5 a card is probably getting a bit too pricey. 1978 Incredible Hulk Drakes Trading Cakes - 24 cards featuring comic book cover images on the front and t-shirt, mug, and poster offers on the reverse. 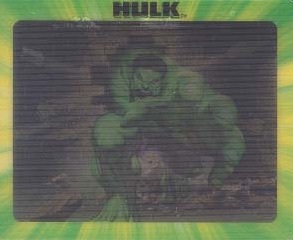 2003 Nabisco Hulk Trading Cards - Three lenticular cards packaged in select Nabisco snacks with comic based imagery. At 3.25”x4”, these are larger than normal trading cards. 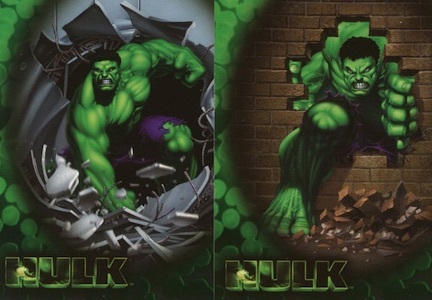 2003 Fla-Vor-Ice Hulk Trading Cards - Five cards packaged in every fourth box of Fla-Vor-Ice product with original Hulk artwork that has no likeness to the film they were released to promote. 2010 Iron Man 2 HULK "Sketch Card" BOX FRESH!! !